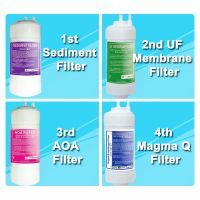 More than just a filtration system! Patented 4 Stage Bio-Ceramic Filters turn ordinary tap water into alkaline antioxidant water! Detoxify and hydrate with small micro clusters, flush out toxin, enable nutrient supply to improve blood circulation, slow down the aging process and lower the risk of chronic diseases. Antioxidize with high negative ORP to boost immunity and fight free radicals caused by environmental pollution, the chemical composition of food in our diet, smoking, drinking, stress, etc. Mineralize with essential minerals to help promote metabolism and maintain good bone health. Oxygenate with abundant dissolved oxygen to enhance stamina. FDA tested ceramic which emits far infrared and radiant energy with strong sterilizing power. Magma Q is prominent outstanding for sterilizing. Magma Q is a kind of artificially synthesized jeolite, which emits far infrared and radiant energy. It does not change water's composition, taste and smell. So the water treated with Magma Q has a just same taste of mineral water. Magma Q has strong sterilizing power on all hospital bacterias, which are contagious by water. Magma Q has very strong sterilizing power against cholera, paratyphoid, typhoid, staphylococcus, yellow staphylococcus, diphtheria fungus, spirillum. Because of its unique characteristics, Magma Q removes harmful heavy metal and radioactive isotope such as lead, Cesium 137, Cadmium, Strontium 90 dissolved in water. And the water which Magma Q was added to has abundant inorganic minerals, and the ration of Calcium and Magnesium become more than 3:1, which improves to control harmful activity oxygen. Also Magma Q can make alkaline water. It kills general bacteria of the water inside. And it keeps clean water for one year without any other changes of water quality. There's no content for now.